Due to their active ingredient L-ascorbic acid 2-glucoside, the 3 items of this set (medicinal face lotion, medicinal essence, and milky medicinal lotion) all work to suppress the formation of melanin and help to prevent freckles. 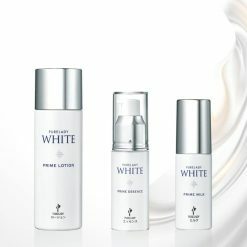 Each set contains 1 bottle of white prime lotion, 1 bottle of white prime essence, and 1 tube of white prime milk. Our 3 white prime skincare items, packaged together for your convenience! These skincare items work together to help moisture in reaching the whole surface of your skin. They can protect your skin from dehydration, keep it smooth, and ward off cracking. The prevention of breaks and cracks due to dryness is important not only cosmetically, but also to prevent openings in the skin through which dirt and bacteria might enter. This item has undergone allergy testing and stinging testing (testing to see whether application of the product causes skin irritation or stinging or burning sensations), although this does not guarantee that no customers will experience allergic reactions or skin irritation. All 3 items in this set are compact in size, making them portable and easy to store. In addition, very little of each item needs to be used in each application, making them cost-efficient and long-lasting additions to your skincare repertoire. 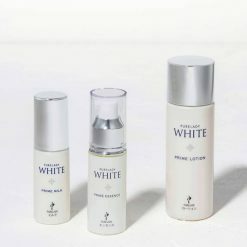 Apply the white prime lotion first, then the white prime essence; and apply the white prime milk last.The white prime milk can also be used as a makeup base. This product contains please refer to the ingredients lists for items 08414 (White prime lotion), 08415 (White prime essence), and 08416 (White prime milk)..